I have been sitting on this recipe for nearly 10 years now, yowza! A good friend of mine gifted me with this recipe back when recipe swaps (on actual written recipe cards) were all the rage. It’s been sitting in my binder of “appetizer recipes” ever since, and while organizing and purging this weekend, I realized that I’ve never shared it with you. Doh! If you’re a dip person (and, really, who isn’t? ), then this is definitely going to make your day. As far as recipes go, this one couldn’t be much simpler. 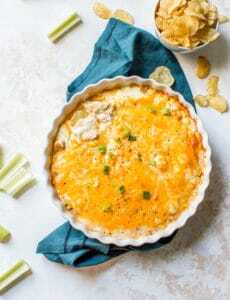 Only four ingredients, and the same exact quantity of each – 2 cups each of chopped Vidalia onions, mayonnaise, shredded Swiss cheese, and Parmesan cheese. Mix, bake, eat. I love the sweet bite of the Vidalia onions paired with the cheeses; it’s totally and completely addicting. Once you try it, you won’t be at all surprised by the fact that my Chief Culinary Consultant and I ate it for lunch yesterday. Yes, just dip and pita chips. Nothing else. Lunch. Done. The recipe as given to me says to serve with pita chips or breadsticks (I feel like the pita chips recommendation was so ahead of its time 10 years ago! ), but this would also be fabulous with pretzels, tortilla chips or baguette slices. Basically, any and all carbs are welcome at this party. 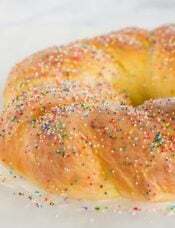 Do you have a favorite simple staple recipe from ages ago? Feel free to share it in the comments below! 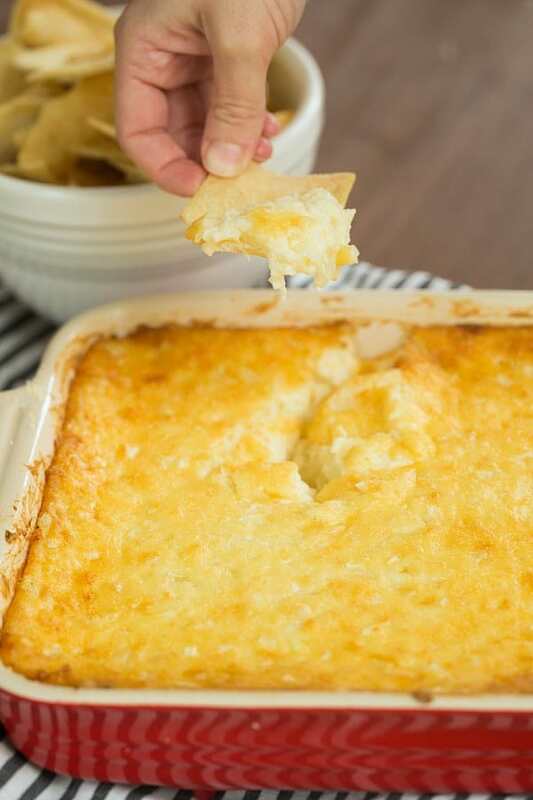 A sweet and cheesy dip with only four ingredients; everyone is going to want the recipe! 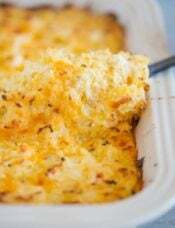 Stir together all ingredients and spread in a 2-quart baking dish. Bake until the top is golden brown and bubbling, about 1 hour. Serve immediately with pita chips, breadsticks or pretzels. Thanks for posting this recipe. I can’t wait to try it. I know it will be great. QUESTION – did you actually grate Parm cheese or did you use the “can”? Did you buy shredded swiss or did you shred your own block of cheese? I buy fresh grated Parmesan at the cheese counter of my local supermarket. And I do shred my own block of Swiss… pre-shredded cheese just isn’t the same in baked recipes. Thank you Michelle for answering my comment question. I agree that fresh grated parm is the best. I read once that the bagged grated cheeses are mixed with flour and I’m sure that isn’t good for things that are baked. I will use them for sprinkling on tortilla chips and putting them in the toaster oven to melt but thats about it. I absolutely love this old southern favorite. I amped this up from my grandmother’s traditional way as you have listed by taking out the Swiss. We have already spread on soft pita or crustini (thin sliced baguette) and baked until bubbly as a passed appetizer rather than a dip. I remove the Swiss and add a container of gorgonzola. It is so good. Love you site!! Some great favorites. This dip grabbed my attention last week and had to be made this past weekend. It is amazing. Delicious…really unbelievable… good job!!! This looks like one of those dips I stand by the whole night at a dinner party – sounds amazing! 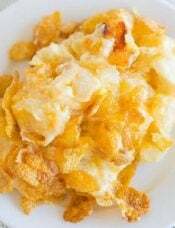 I love Ina Garten’s Pan-Fried Onion Dip, minus the cooking oil. 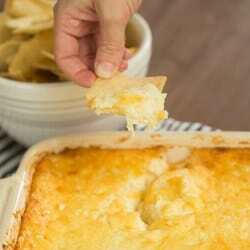 The carmelized onions just make this dip! I’ve been sitting on a bag of vidalia onions for awhile now. I really want to make a dip but the occasion for a dip has not come up yet. I may need to just make it and eat it for dinner haha. Really good with big scoop frito. One of my favorites! Thank you for sharing this recipe. I am definitely pinning it and making it soon. 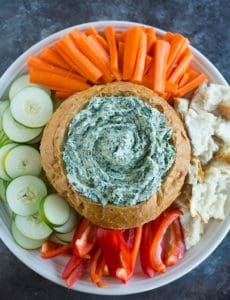 Warm dips are my favorite, even in the summertime! Funny–I too received this recipe about 10 years ago on a recipe card! Only my version uses extra old white cheddar. Delicious. For my bridal shower (21 years ago), I decided I wanted to have each guest submit a recipe. My aunt, who hosted the shower, bought a beautiful flowered box with formatted recipe cards, which we inserted into the invitations. Today, my box is filled with recipes from family and friends, and is very special. Still in style, if you ask me! What a thoughtful thing, great idea. Recipe cards are the best. I have saved all my grandmothers. My mother had only a few that survived and I have those also. I will pass these on to my daughter along with all mine. I am not sure that she will value them as much as I do, in this age of the iPad, pull-up a recipe on demand. As a lover of onion dips, this sounds like the tops! I shall make this for my next get together, if not before — maybe when I make my next batch of ice tea and my friend and I celebrate the sunny day! I love this with any good bread and even with cucumber slices if we are trying to cut our carbs. 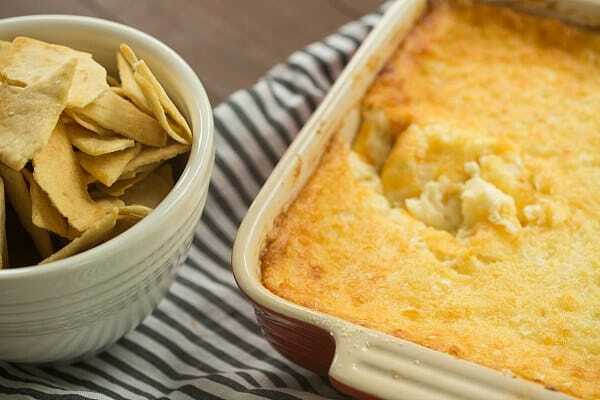 I have a similar recipe – but it includes adding a little texas pete in there to give the dip a little more fun flavor. If you like adding a kick, try tossing a bit in as you stir it up. My husband and his friends LOVE it. This looks delicious!! My go-to super easy party recipe is always Pickle Dip. You take 1 block of cream cheese, 1 c. sour cream, finely chopped pickles to taste (I use a lot, or you could use a little–it’s totally up to you), 1/2 c. chipped beef, and garlic salt to taste. 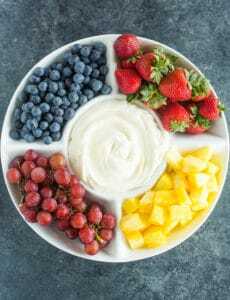 Whip together the cream cheese and sour cream until it’s a dip consistency, add the other stuff, and serve with pretzels. Delish. If you really like the sour pickle flavor, you can even pour in some of the pickle juice too. YUM!! Love your lunch “menu” – except that I would have added a couple of glasses of Chardonnay to the mix :-). I just made a similar hors d’oeuvres that combines cooked onion (regular, not sweet), cream cheese, and Swiss and spreads it on tortillas, roll them up, refrigerate them, then cut them into 1″ “bites’, and bake. Delicious and easy. I love the combo of the onion and Swiss cheese – reminds me of quiche Lorraine. This looks fabulous and I can’t wait to try it! My go to is Chicken Ball (or dip) which you already have on your blog. Have been making that one for years. I have this recipe too, and have forgotten all about it until now when I saw your post. This is so delicious; not sure how I could have forgotten about it . . . must mean social life is at a low right now ;) haha! And, hand written recipe cards are the best. They make me think of the person who gave me the recipe each time I use the recipe and see the handwriting. I think recipe cards have become “vintage” and should be revived and used!! 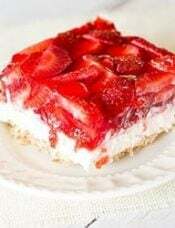 Thanks for posting and writing about this recipe. This looks right up my alley, thanks! 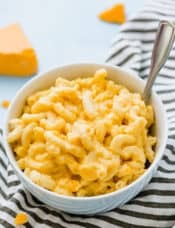 My favorite super easy appy recipe? Block of cream cheese (low fat, not non-fat, works), pour over a jar of pepper jelly, surround by some form of crackers. It’s pretty and very addicting with the salty, sweet, spicy things going on. I make something similar – cream cheese with Harry & David pepper relish. Just mix together the cream cheese and a jar of the relish – it’s sweet and spicy. Love it! How much cream cheese with the pepper relish? No mayo? A friend gave this recipe to me several years ago also. Love great friends with great recipes! She always served it with Ritz crackers. I love the pita addition…it really needs a sort of buttery, bland dipper because it’s plenty salty from the two cheeses. I could eat the entire pan myself, so I force myself to only make it when plenty of people will be around! Ritz would be awesome with this, great idea! This dip looks magical!! Yum! 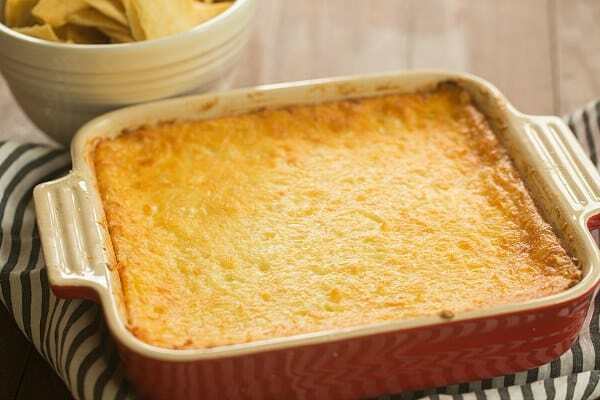 Yum, cheese and onion dips are the best. I love that this recipe is easy to scale up or down! 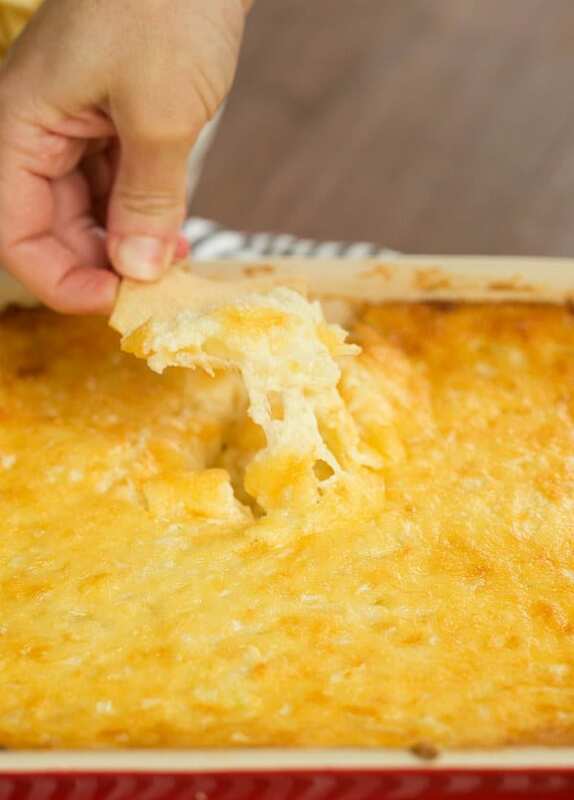 I have a dip recipe almost like this (uses cream cheese rather than the swiss) and I seriously could eat the whole thing myself if I let myself! Yours looks like that kind of dip for me, too! Wow, I would babysit this at a party til it was gone! 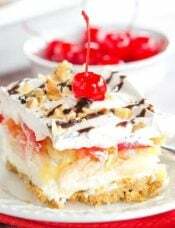 Think I will make this tomorrow. I absolutely love recipes that have a quick & easy ratio – and a 1:1:1:1 is as easy as it gets. It allows you to make the size you’re looking for.